Do the TDK BA-100 in-ear monitors offer enough to justify the price? Complementing TDK's recent on-ear high-fidelity headphones such as the TDK ST-700 and TDK ST-800, the TDK BA-100 is an in-ear monitor model. It has an unorthodox balanced armature design that often results in superior tonal separation, hence the relatively hefty price tag. But can it outrank traditional dynamic driver models such as the Etymotic MC2 Android headphones, Beats by Dre ibeats and the lughole-loving Shure SE315, all of which are among the best headphones around? You won't find, external controls, funky colours or trendy translucent plastic housing here. Predominantly clad in black with just a silver disc covering each driver, the TDK BA-100's sober design is aimed at the audiophile. Supplied with four silicone tips and a pair of Comply memory foam tips the intention is to find a fit that creates a comfortable, yet sonically sealed, canal in order to deliver maximum bass performance. The 52cm flat cord comes with a 75cm extension, plus there's a shirt clip and 6mm adapter plug, all supplied with a rather nifty squeeze-to-open suedette pouch for storage. Finding the perfect fit is a personal matter and while we cannot guarantee that any of the supplied tips will work for you we found that both the default silicone tip and memory foam option resulted in a beautifully snug fit, with the latter proving the most comfy for extended listening sessions. A minor issue is that the cords resemble slightly sticky black linguine to the eye and to the touch and have an annoying tendency to self-curl. Despite their disobedient tactile qualities, the cords seem strongly made and connect reassuringly into gold-plated plugs. The in-ear nozzle is an equally durable grade of hard plastic and TDK thoughtfully provides spare filters and a wax-removing tool for those who fail to follow its advice on ear cleanliness. Unsurprisingly for a balanced armature model, the BA-100s are highly adept at delivering distinctly clear sounds across the dynamic spectrum. With a perfectly fitting tip you can also get a surprisingly full amount of bass. In fact, the bass emphasis is possibly too dominant for ears accustomed to dynamic drivers. From John Coltrane's jazz to Beethoven's Pastoral symphony, to The Dream and Kanye West singing Walking on the Moon, to The Killer's Night and Day album, the rhythmic ballast of their various bass instruments thud almost uncomfortably and threaten to distract from the excellent clarity and separation of the treble and mid-range sounds. At least sound isolation is incredibly efficient, with no likelihood of scornful glances from fellow passengers on the tube or bus. 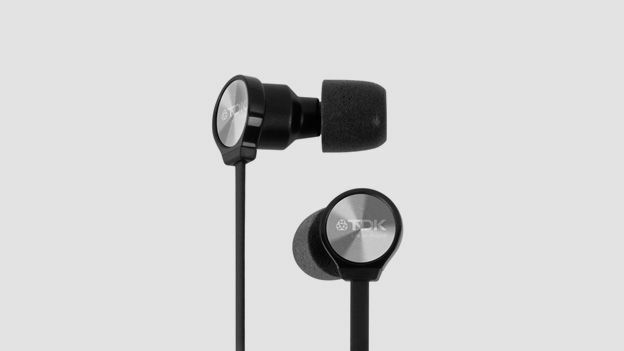 The TDK BA-100 is something of a revelation for in-ear balanced armature monitors, delivering a thumping bass performance. Trouble is, that deep affection for bass is arguably too strong, leaving superbly reproduced vocals and higher frequency sounds struggling to make their intended impact. But if bass emphasis is your bag, the BA-100 should be right up your street. There's nothing terribly exciting about the model's looks, design or finish, but build quality is reassuringly impressive. The phones are supplied with everything you need to customise them to your own ear's size and shape and a mini maintenance kit is even included.